Calendar Live Tile is a free Windows 8 Calendar app that lets you add a live tile calendar on your Windows 8 Start screen, which you can customize easily. If you have ever noticed the default Windows 8 Calendar app, you must be knowing that it is limited to the Day’s views. If you wish to see the full calendar, you will have to open the app. What if you have a live tile Calendar that can show you the entire month’s view at a glance, or can be customized to the font, size, and color theme of your choice? Calendar Live Tile is such an app that generates a customizable, monthly Live Tile Calendar for your Windows 8 Start screen. With this app, you can easily view which date falls on which day of the month and even add multiple monthly tiles on your Windows 8 Start Screen, thereby, avoiding the hassle of opening and closing the app again and again, just to see the full calendar. Install this app and have a detailed live tile calendar on your Windows 8 Start Screen. Let’ see how this Windows 8 Calendar app can be added to your Windows 8 Start screen. To add this useful Calendar Live Tile app to your Windows 8 Start screen, go to Windows Store and search for this app using Win+Q key combination. You can also look for this app in the Tools category or click on the link given below to view it directly in Windows Store. Once you install the app to your Windows 8 system, it will show on the Start screen. Click on it to launch the app and it will appear as a Live Tile Calendar. You can drag it to put it on the desired place on the Start screen. To customize the look and feel of the Calendar, you can click on the live tile to launch the app. This will open the app’s main screen. From here, you can easily set your preferences for color, font, theme options, lines, rounded corners, glass effect, etc., and give the desired look to your Calendar. A preview of the Calendar tile in different sizes will also be shown to you. Plus, if you right-click on the app’s screen, a bottom flyout will appear from where you can pin multiple Calendar tiles (for each month) to the Start screen. Once you are done, you can close the app to reflect the changes on your live tile Calendar. 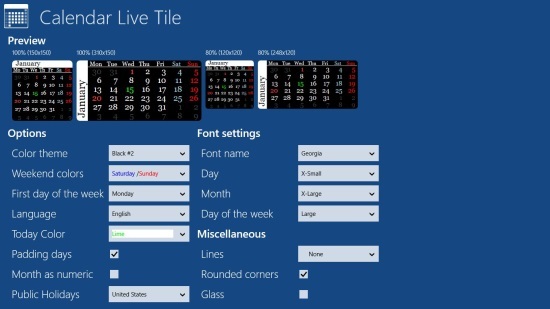 Free Windows 8 Calendar Live Tile app. Generates live tile Calendar for a month. 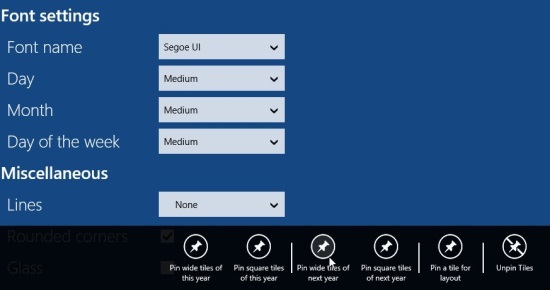 Option to pin multiple live tiles for every month of an year on the Start Screen. Option to choose font style and size. Option to set preferences of language and colour theme. Option to show Public Holidays (US and Japan only). Tiles can be added in different sizes. Also check out how to add a live tile Clock to Windows 8 Start Screen. Calendar Live Tile is a nice free Windows 8 Calendar app that lets you add a detailed live tile Calendar to your Start screen and easily customize its look and feel. Go ahead and install now. Share your feedback via comments. Get Calendar Live Tile here.